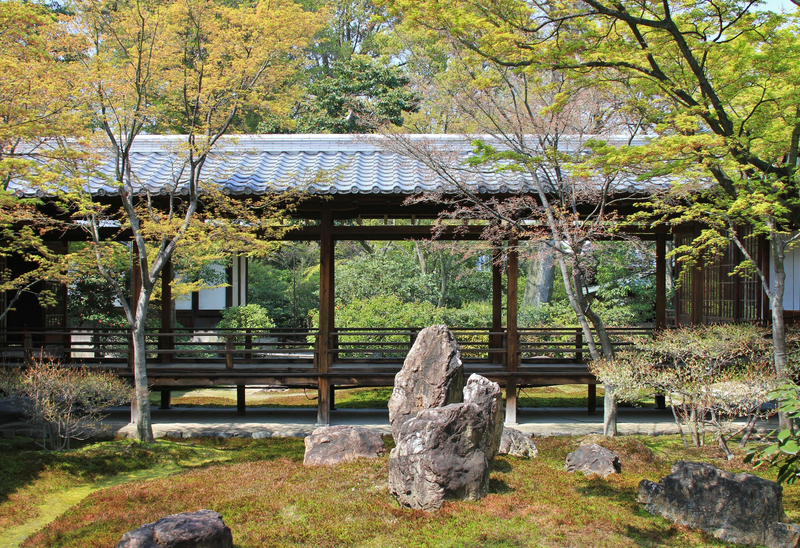 Wood in a Japanese garden is as important as bamboo. 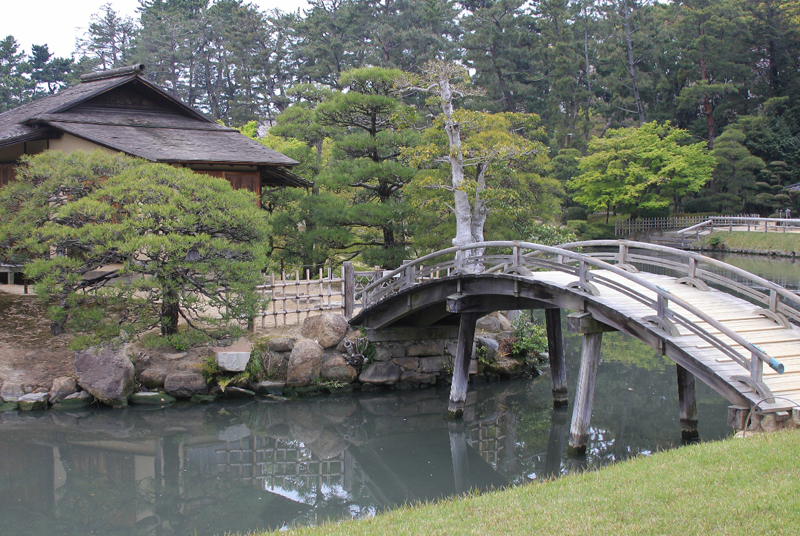 Japanese galleries, bridges, decks are all made of wood. It’s also used in the construction of summer-houses. 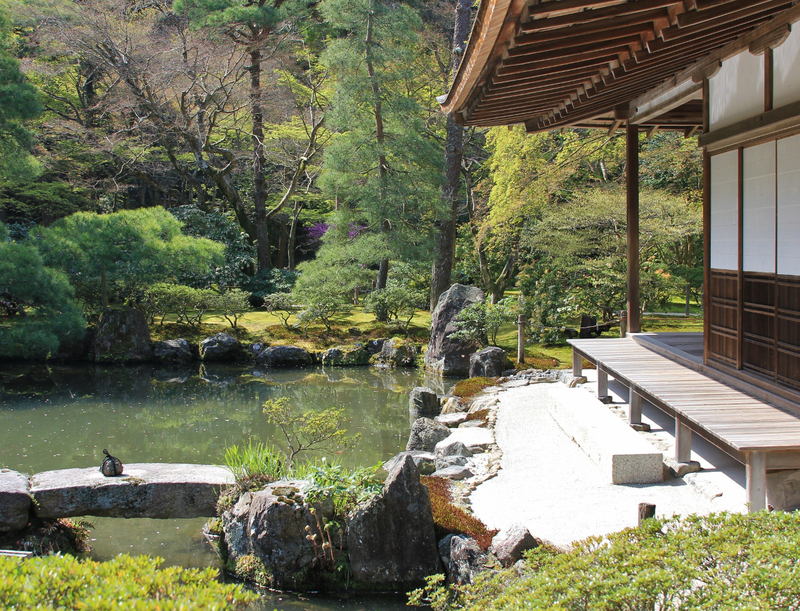 Bird feeders, which look like Japanese houses, could become an original decoration of your garden. 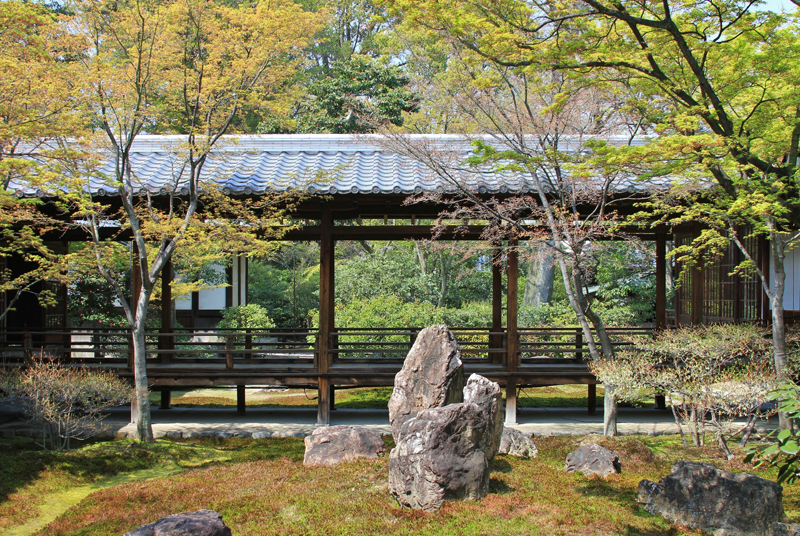 A wooden lantern looks like a Japanese lantern made of stone, sometimes a wooden one fits the surrounding better. 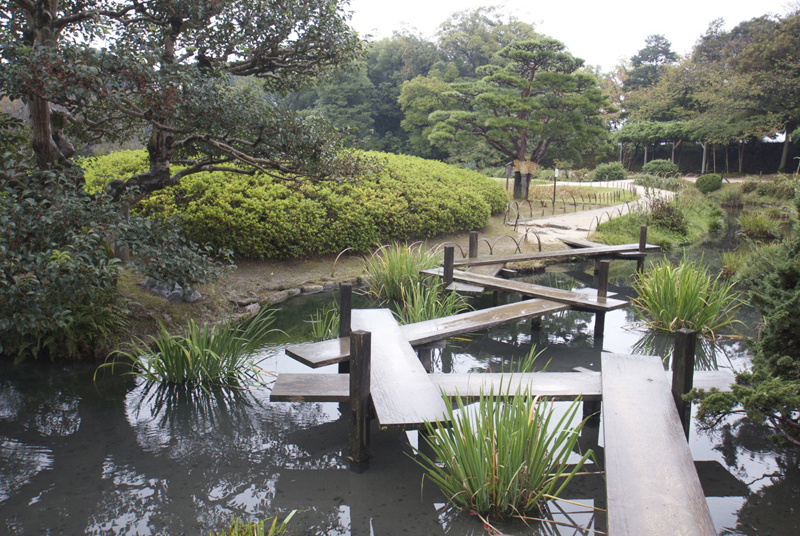 Even though benches aren’t typical for a Japanese garden, the Russians can’t imagine their gardens without them. So if you decide to change a part of the territory into a Japanese-styled garden, you can put a wooden bench there. The first thing I’d like to draw attention to is galleries (engawa). 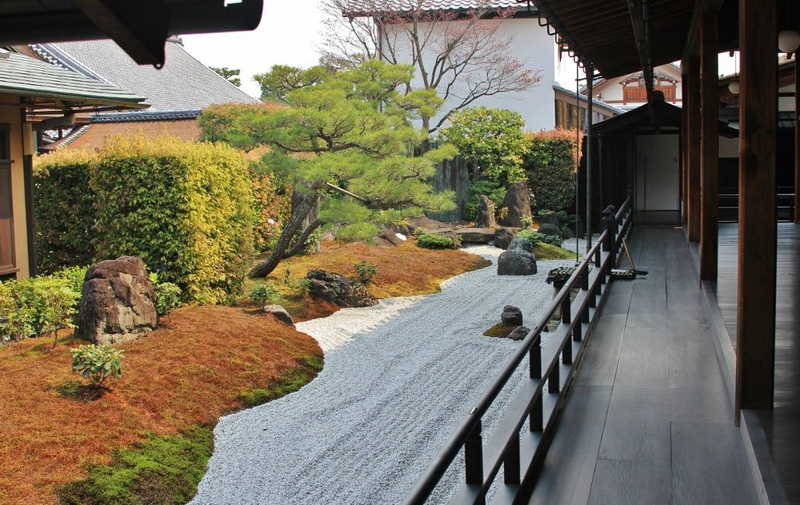 Japanese galleries are covered ways from one building to another. 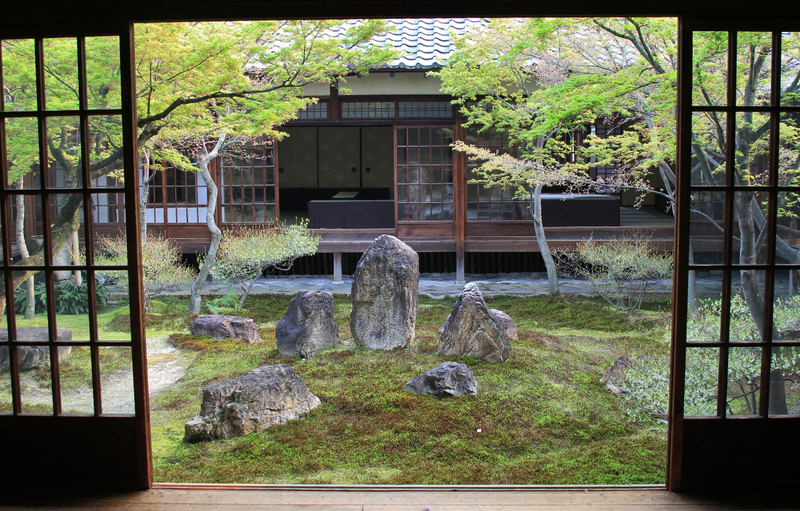 Galleries were first mentioned in the middle of the 10th century. At that time the central palace, situated on the territory surrounded by an adobe fence, was connected with other buildings with the help of covered ways. 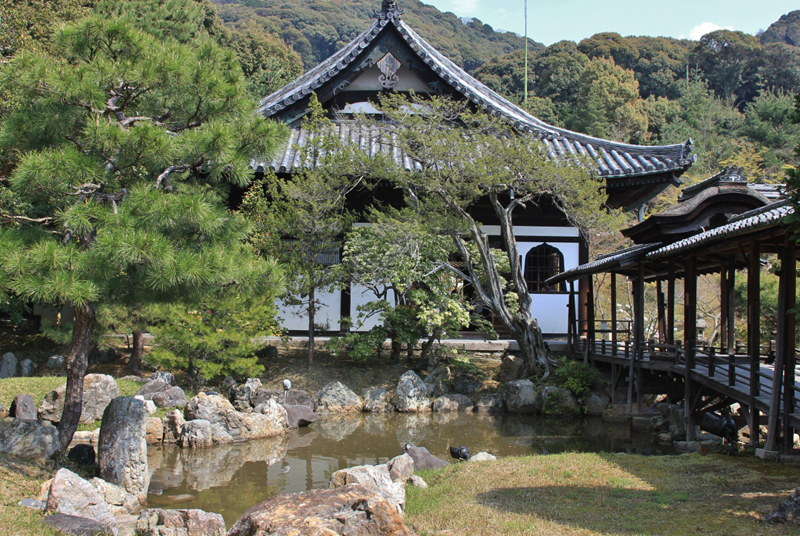 Besides, there was a passage to a fishing pavilion (tsuridono), which was situated near the pond. Galleries became really popular in the second half of the 16th century, when a new type of a town house (machia) appeared. There were other constructions around it, so the rooms in such a house were dark and stuffy. That was the reason of the appearance of a new architectural style. The berthing area was built very close to the shopping area, then, there was a storehouse, a workshop and a tea room. All these constructions were built separately but they were connected with covered passageways. That helped solve the problem of ventilation and lighting. Nowadays there is no such a problem any longer. 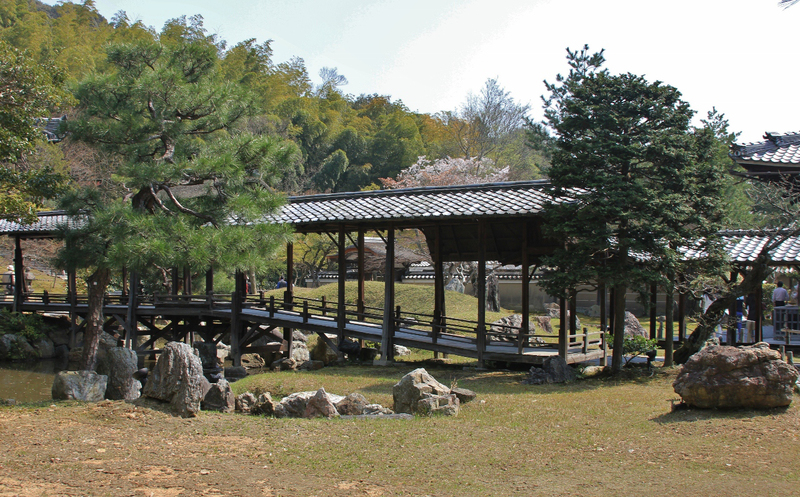 However, covered passageways can still be seen in Japan. 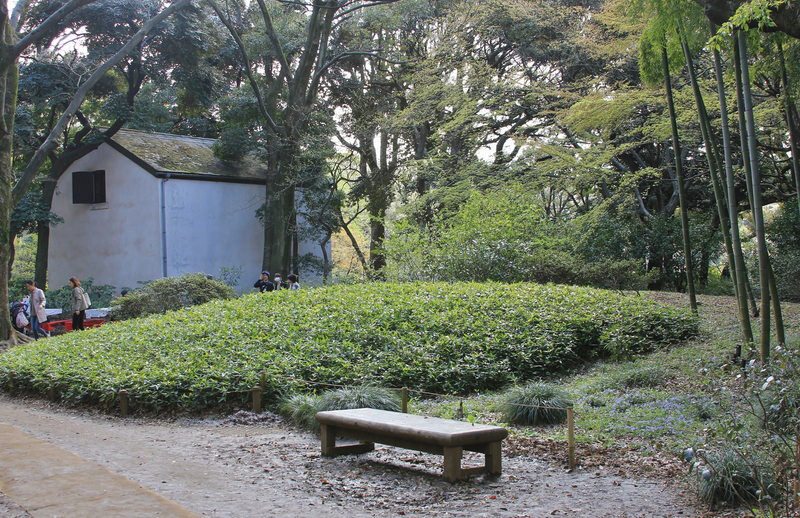 Where can covered passageways be used in our gardens? First, these are ways along the house. In Russia in winter it’s dangerous to walk under the roofs of the houses because of snow and ice falling down, but the paths are usually paved next to the houses. We can sort it out! 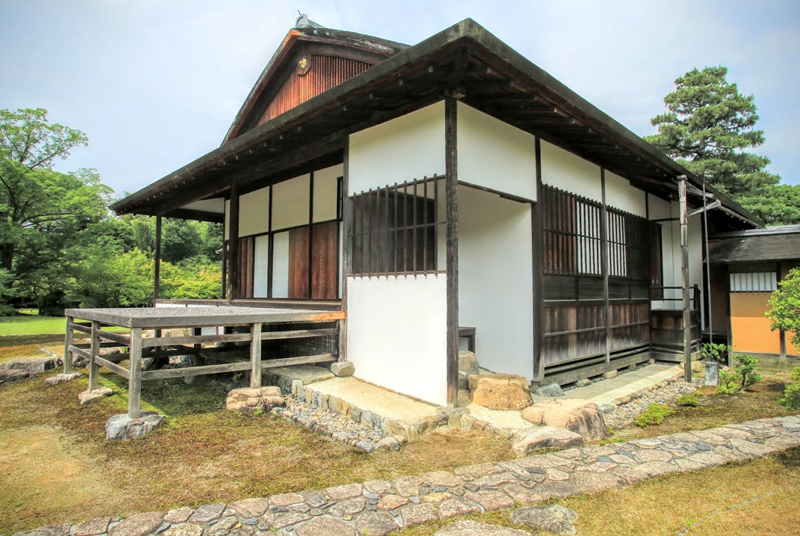 Make a cover along all the length of the passage, place a decking and decorate this as a Japanese gallery. Besides, it will be nice to stand there during the rain admiring the beautiful scenery. 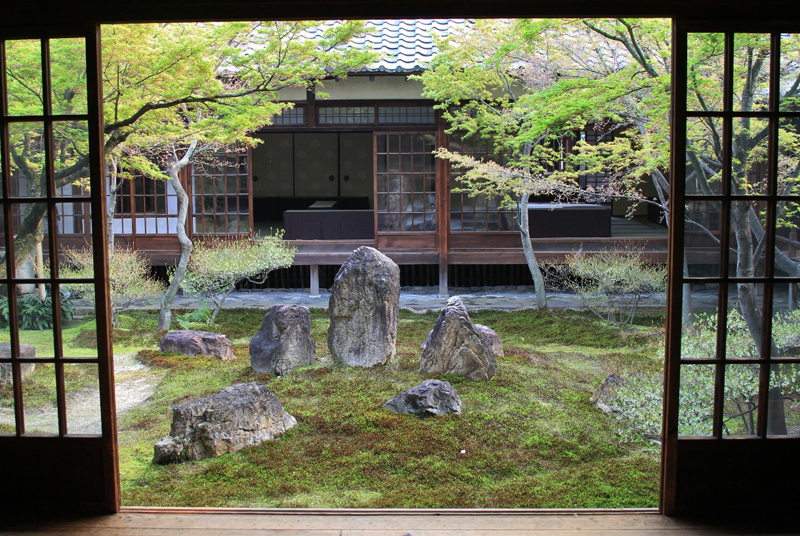 If the pass along the house is not used often, you can also put some cushions there and spend time relaxing and meditating. 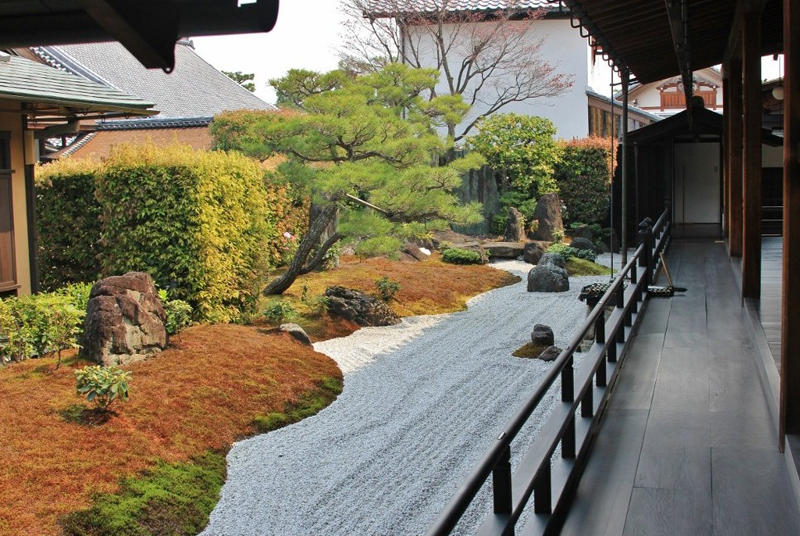 Second, we can decorate the paths leading to the bathhouse or parking place. The lack of snow in winter is a good point here and in summer, when it pours down, you don’t have to run, you can just walk slowly without getting wet. The next wooden element is a bridge. 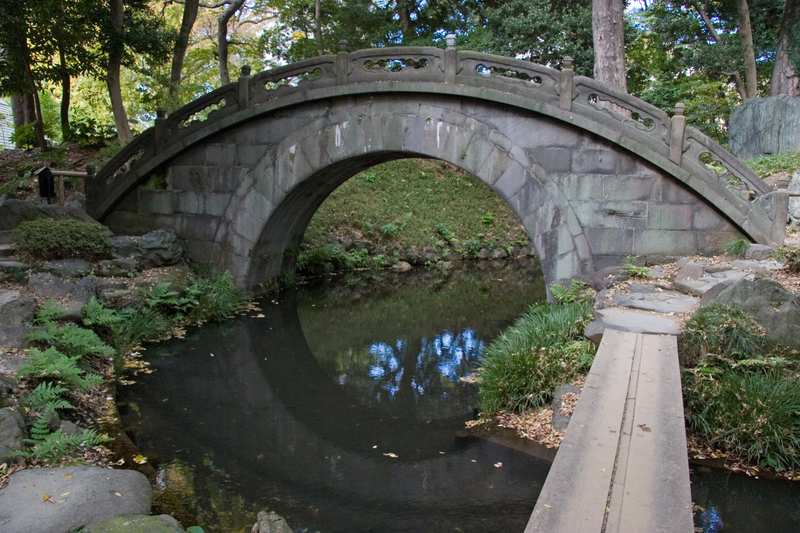 Speaking about a Japanese garden, many people picture red bridges curved in the shape of an arc, but it isn’t always true. These construction and colour are more typical for China even though they were quite popular in the era of Heian when the Chinese influence was strong enough. At that time the aristocrats enjoyed boating. At that time the red semi-circular bridges appeared (often they were lacquered) , under which it was possible to float during the water rides. Sometimes these bridges were not meant for walking, but were merely as a decoration. Engetsu (Full Moon Bridge) is really amazing. It’s a sickle-shaped bridgewhich looks like the full Moon while reflecting in water. 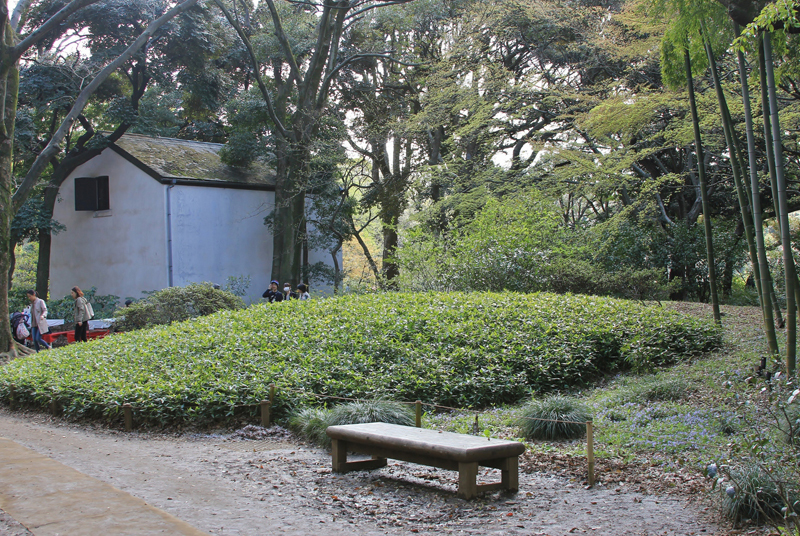 Another interesting example is Taiko- bashi bridge or ‘drum’ bridge in the tea garden in San Francisco. That bridge was specially created for the Japanese exposition at the international fair in 1894. You can come across so-called ‘covered’ bridges in Japan. These constructions are for admiring the beautiful scenery whatever the weather is. So, they serve as a bridge, a gallery and a viewing platform at the same time. 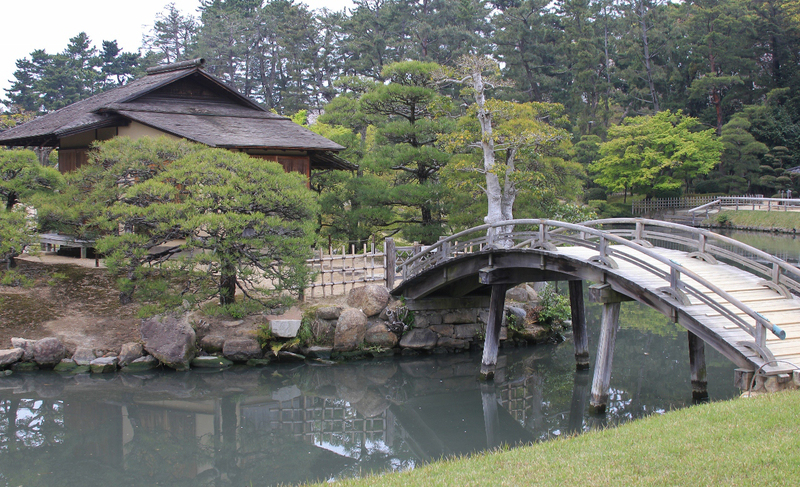 The garden of Tofuky-ji monastery where there is such a bridge deserves your attention. 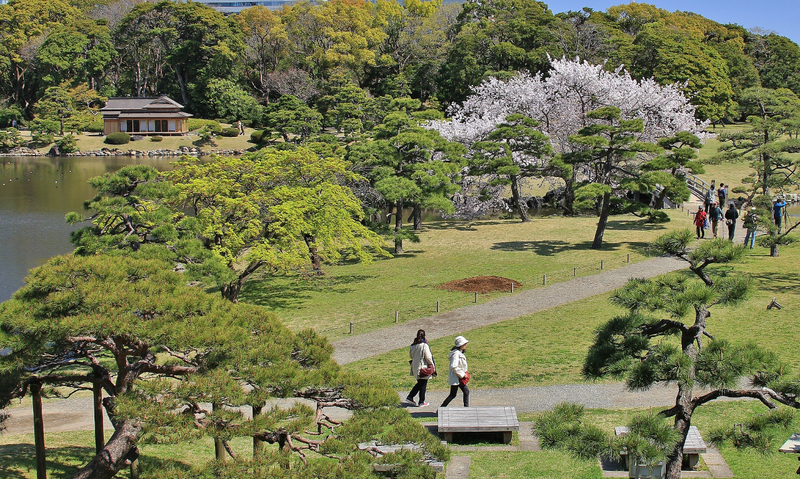 There is a special canopy above the most wonderful place to see the garden. 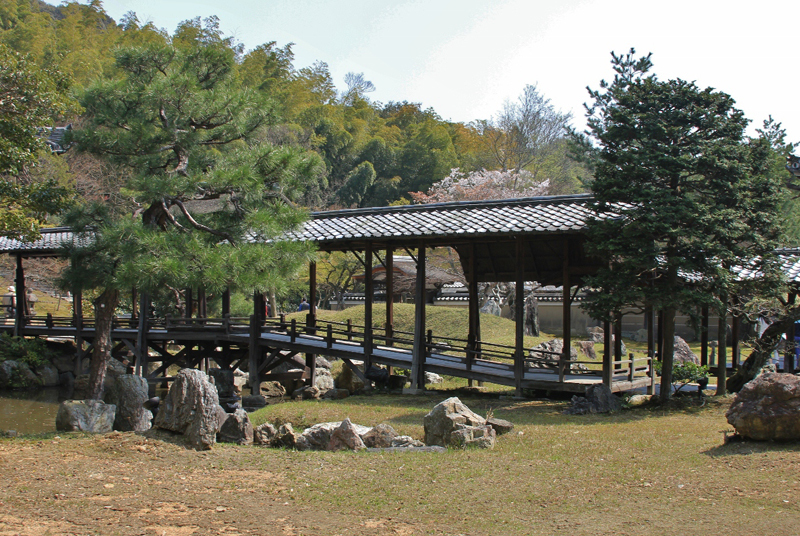 However, we are more interested in yatsuhashi bridge (yatsu is eight, hasi means bridge). The bridge usually consists of eight parts, placed in a zigzag manner, and carries out a philosophical message. 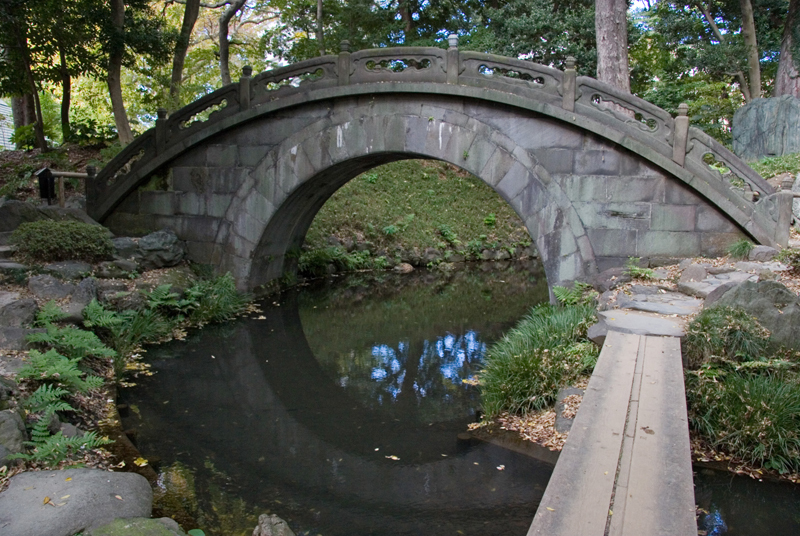 According to legends, spirits can move straight only, that’s why a zigzag bridge protects from evil spirits. One of the elements of the bridge is often badly fixed so the bridge becomes wobbly. It’s done on purpose to show how complicated spiritual development is. Despite the fact that there must be eight parts of the bridge, it’s possible to make only three or five as all these numbers are symbolic. Number “8” is connected with the way of comprehension of the truth which has eight steps. The wheel of Samsara in Buddhism has eight spokes. The ashes of Buddha were divided into eight parts. Sometimes a group of eight elements is replaced by two groups consisting of three and five components. These divisions can be seen in path paving or making stone compositions. Number “5” has several meanings. Buddha had five followers, there are five Buddhist commandments, five ways of achieving the state of liberation, besides there are five main elements of nature: Water, Fire, Wood, Metal and Land. Number “3” symbolizes three Buddhist treasures: Buddha of the Present, the Past and the Future. 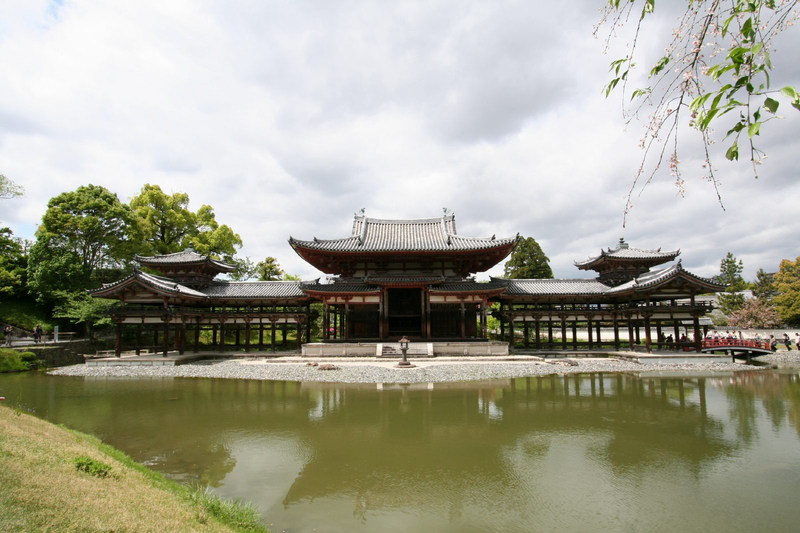 There are also three bodies of Buddha and three sacred relics of Shintoism: a sword, a jasper necklace and a mirror. In this way, it’s not really important how many parts your bridge will consists of. The main point here is the meaning of the number. So we can build yatsuhasi on any territory. 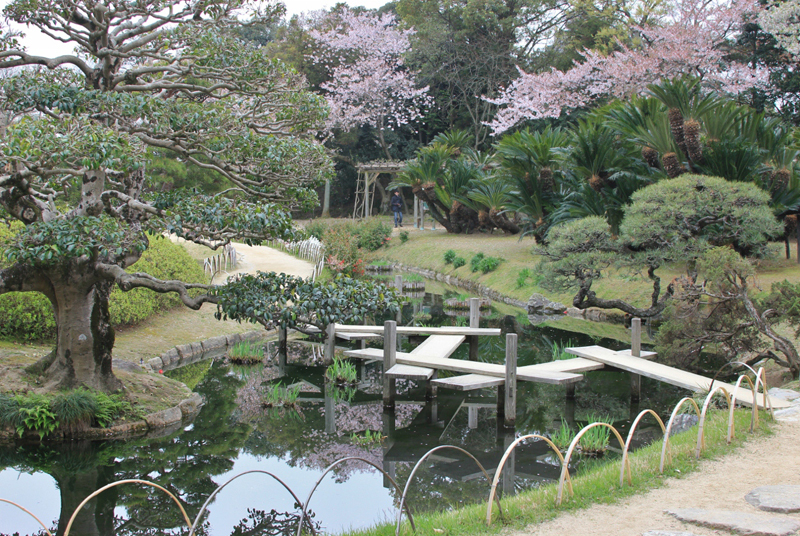 The bridge stretching over a small pond could be the best variant. Moreover, we can imitate water by planting irises and creating the illusion of wetland. 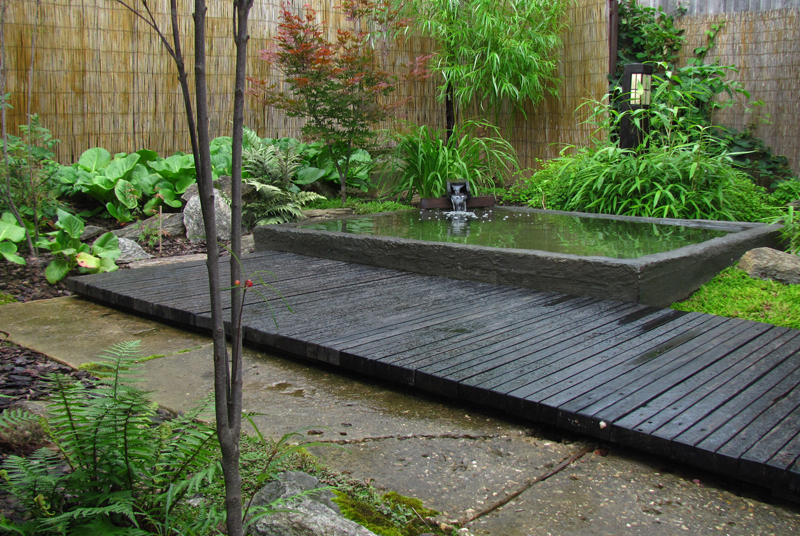 We can also make wooden decks in your garden. 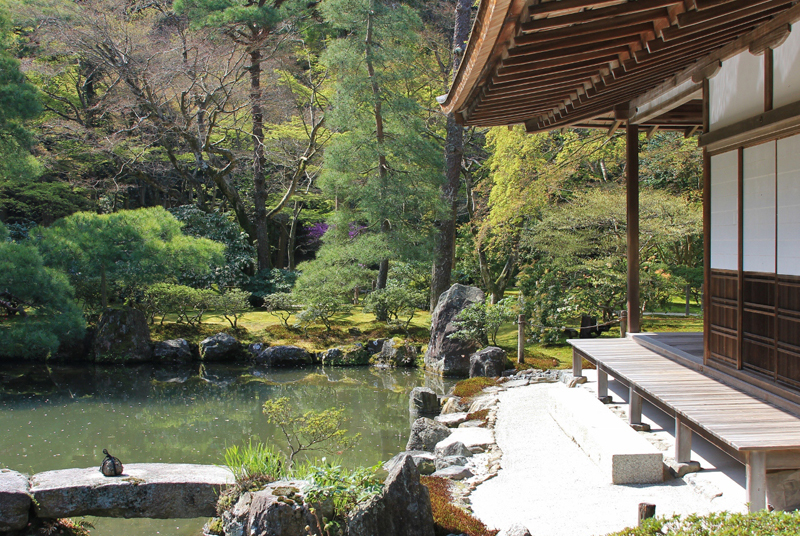 As a rule, benches in small gardens aren’t typical for Japan, so, decks are used to sit on. They can be built near the house, a pavilion or by the pond. 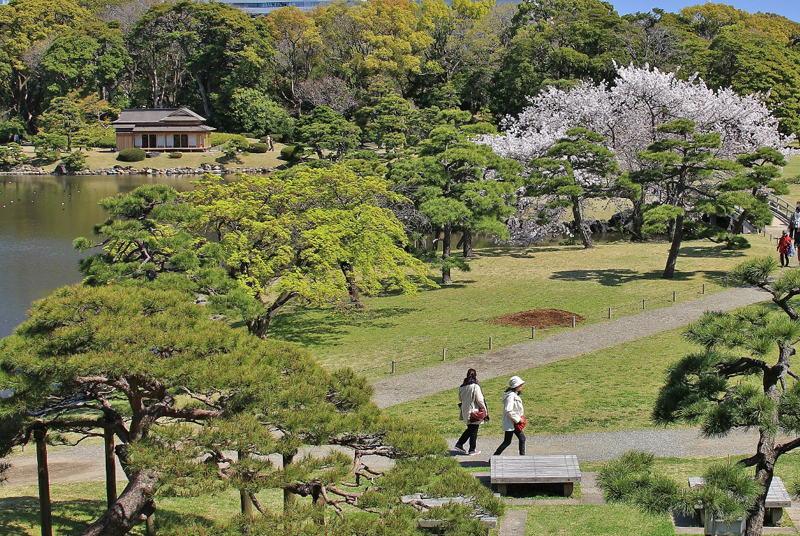 For example, Tsukimi-dai (translated as platform for the contemplation of the Moon) was built next to Katsura Rikyu palace in 17th century. 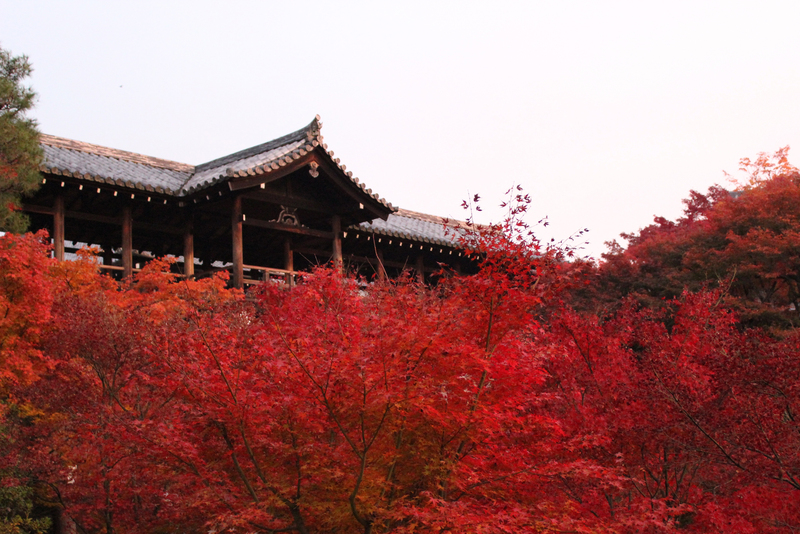 In the middle of autumn the moon was just above the platform so that the master could admire it in the evening. 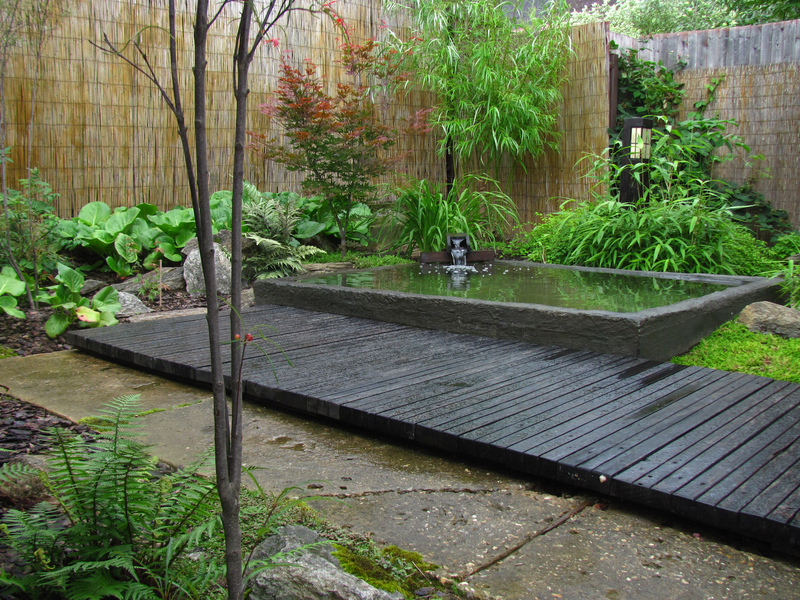 We can also choose the most attractive place in the garden and build a deck there. 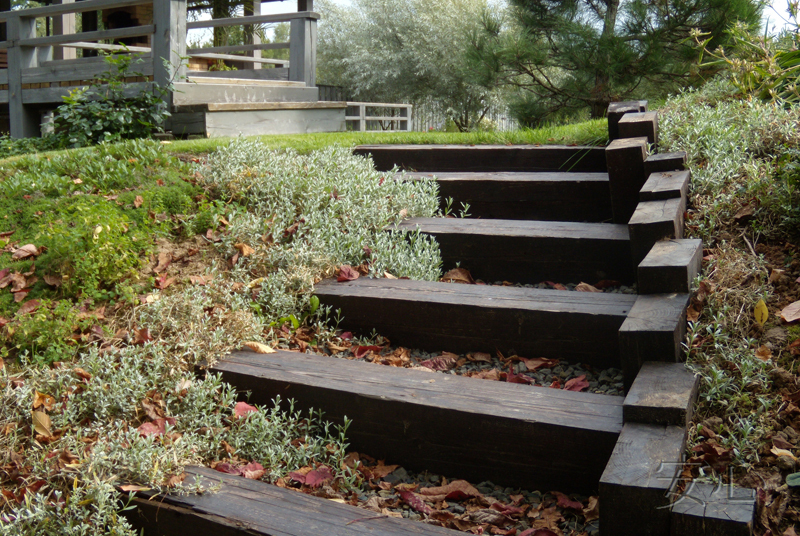 Finally, you shouldn’t forget stairs, which can be beautiful, original and in Japanese style. 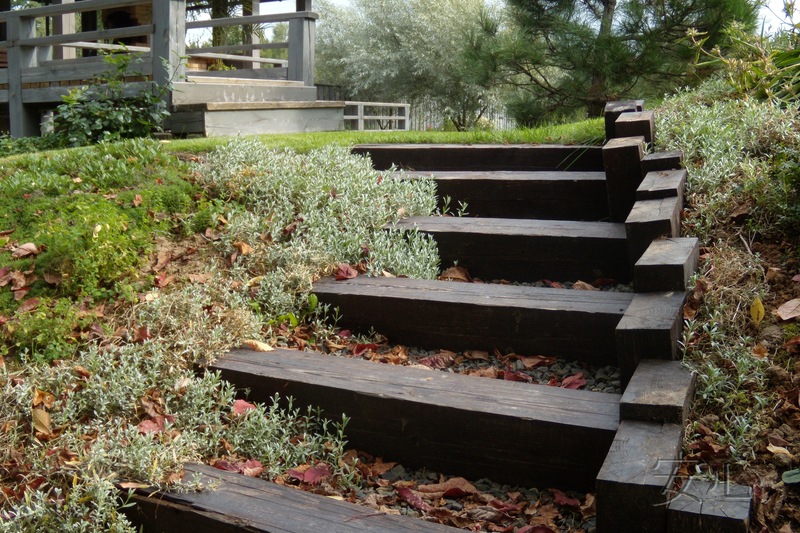 Wooden steps will look lovely in a Japanese garden and decorating them with plants can give your stairs a unique charm. Authors of the photo: Elena Glubokovskih, Alexandra Basova, Gleb Uspensky, Elena Borsjakova, Yuichi Azuma, Irina Andrianova.